I commute for about 45 minutes to work, down I-10, a pretty busy freeway even "against traffic" (opposite direction of the rush hours). Recently they started doing construction, the first phase of which was to close the freeway and narrow the lanes to their bare minimum width, in order to provide room for what they are doing. As I zip along these new, narrower lanes, I feel my knuckles cramping and growing white from the grip I have on my steering wheel. The reason? The people in the lanes around me who keep swerving into my lane because they are on their cell phones (while going 75+ miles per hour, no less). Do they not think we can't see the glow of the phone as they keep glancing down? There's just no room for error with the lanes narrowed. People need to be paying MORE attention, not less. Not that people should be on their phones on the freeway (or anywhere else behind the wheel, for that matter) but the stakes are higher when the slightest swerve puts you in the wrong lane and into someone else's vehicle. We just had the Saturday session of General Conference, and I was sitting with my family on our living room floor, trying to listen to the leaders of the church. Lately I've felt like it is supremely important to listen to what is being said--not that it's hasn't always been important--just with the way the world is spinning, it feels more important now. 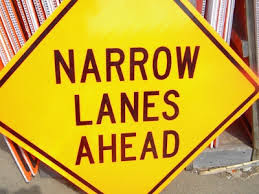 The lanes are narrowing--the "way" is getting narrower, so to speak, and the stakes are getting higher for swerving. So I'm trying to listen, and the kids are spinning on their behinds on the floor, or fighting over a pillow, or a blanket, or a spot on the couch, or I'm having to bark at someone to wake up and pay attention. Meanwhile, I keep turning to my husband with, "What'd he just say?" Distractions. Ugh. I wish I could've listened better, absorbed the feeling of the talks more, instead of only kinda sorta hearing it, and then reading it later. Thank goodness for the conference videos!! But that got me thinking.... how often do we go through life, distracted? I mean, not just the social media, the OTHER media, the everything going on that keeps us only halfway living life. Distracted FROM a million things that really matter, by the BILLIONS of things that really, in the eternities, don't matter at all. How grateful I am for General Conference, and for weekly meetings and for great friends, for the scriptures and for daily personal prayer, all of these things to keep us in the lines--in the Way. Let's do our best to regain our focus and not get distracted!